what a perfect time to put to the test whether it is better value in the long term to buy one pair of quality, higher value shoes or end up buying several pairs of cheap ones through the course of a school year ( or as in our case term !) Do you go for quality shoes that are more expensive but likely to stand the test of boisterous boys or do you prefer to buy several pairs of cheaper shoes and is that just a false economy ? Not only are the twins completely different in every way possible, they also go to different schools. One rides his bike, is usually filthy before he even arrives at school, cycles through every puddle, takes a detour through the park and the skate ramps and basically has no thought for his shoes or appearance what so ever. The other twin walks to school, is obsessed about how he looks, staying clean and tidy, paying particular attention to his hair and goes into meltdown if it is raining when he leaves for school ! Can you guess who is who ? Jarvis was given a pair of similar style, but cheaper shoes from a well known supermarket brand retailing at £14. 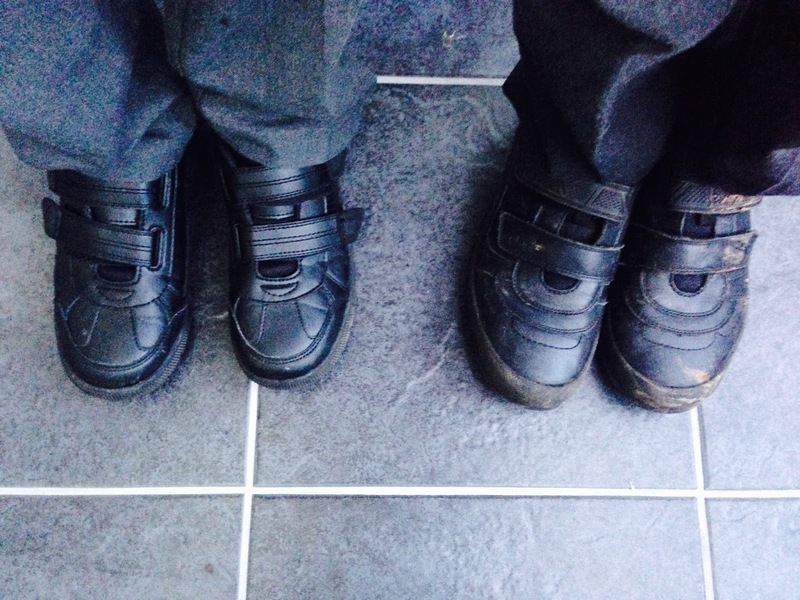 The boys wore their shoes to school for a week prior to the Christmas holidays and have certainly been true to their characters when wearing them. In order to give a fair trial to the shoes I will update this post regularly with pictures of how the shoes are standing up to their test. This is what the boys shoes looked like when they came home from school after the first day. I think Start-rite might have their work cut out for them.